We put up Chevrolet's old-school classic, the Corvette (green in color), against Ford's new-school Ford Fusion Hybrid (gray on the outside, green on the inside), and ran ‘em both hard in a road rally. This challenge had some timeless never-ending grudge matches: Chevy vs. Ford, rear wheel drive vs. front wheel drive, and convertible vs. hard top. And some added new-age grudge matches: Internal combustion vs. hybrid and a generational dispute (Rally Scores: Grandpa vs. Grandson). WARNING: Do not assume any scientific method was used during this challenge. It was merely a bunch of car guys with a Sunday to kill screwing around on country roads. This should not be confused with actual automotive journalism (if there is such a thing) in any way. The rally where we chose to settle this grudge match was run north of San Francisco, CA by the Empire Sports Car Association (ESCA). The gimmick rally would run us miles and miles through some great back roads. Well, I use the word "great" loosely. The scenery was beautiful, the roads were twisty, but there were pot holes large enough to swallow a Smart Car. Our first contestant was a green 2000 C5 Chevrolet Corvette Convertible, or "roadster" as my Dad likes to call it. Rear wheel drive, two seats, with 5.7 liters of gas-guzzling fury under the hood. Acceleration good, gas mileage at wide open throttle, eh, not so much. The Vette was driven by Jim Krider, the patriarch of the Krider Racing enterprise. Jim is a bow-tie man. He has never actually worn a bowtie in his life but he currently owns numerous Corvettes, Camaros and El Caminos –no Chevy man is complete without at least one El Camino. Most of his Chevrolets don't run, but they still hold a special place in his heart, and to the dismay of his neighbors, they also hold a special place in his driveway, the street in front of his house, the street around the corner from his house, a friend's barn or any damn place he can leave a Chevy to rot for a while. Jim's predictions of the challenge results: "I was winning races and rallies before you were born!" Our next contestant was a 2010 Ford Fusion Hybrid. This car runs silent in electric mode, has a hard top and plenty of electronic gadgets for Millennials. It rolls with front wheel drive, with seating for five and an iPod jack with Ford's SYNC system. The Ford hybrid was navigated by 13-year-old Soap Box Derby racer Gus Krider, the grandson of Jim Krider. Gus's predictions of the challenge: "All I want to do is beat Grandpa." The gimmick road rally sent all of the competitors along a confusing and frustrating challenging course. The route instructions were set up to trick you into going the wrong way and then ask certain questions during different parts of the route. If you read the instructions correctly (like the occupants of the Ford did) you got the answers correct, if you were lost (like the occupants of a certain Chevrolet) you got the answers wrong, thus a lower score. Once we all made it safely to the finish line, the bench racing began, pizza and beer was consumed (Root Beer for Gus) and the totals were tallied. The Corvette's V8 sounds great, runs great and uses gas… greatly. It ate up over a third of a tank of fuel during the rally. The Ford Fusion Hybrid used less than a quarter of a tank, however according to Ford's environmentally themed display, our driving pattern during the rally murdered numerous trees in the Amazon rain forest. Below was the environmental display (with lush forest) prior to the rally. The Fusion Hybrid clearly had the upper hand in the fuel mileage department and earned the first point in the challenge. Using a finely tuned accelerometer called TSOMP "The Seat Of My Pants" I determined that the Chevrolet Corvette was quicker than the Ford Fusion Hybrid. But the Fusion got up and went better than most people would expect. It went fast enough around the country roads to make the navigator sick. Good news though, leather seats are easy to clean. Twisty roads would normally be the Corvette's playground but a low ride height combined with rally roads gave the ole Vette some grief. If you didn't keep your hand firmly on the steering wheel, the low profile tires and ruts in the road would try to steer you into a ditch. Ditch time is not what you're looking for in a road rally. The Fusion Hybrid was a well balanced car and handled the poor road conditions with ease. It was very easy to drive with plenty of windshield to spot upcoming road signs (and rally clues). Even though he will never admit it, Jim had a tough time listening to his navigator during the rally over the squeaking of the Corvette's dashboard. The Ford Fusion Hybrid rolled up and over bumps in the road with no problems and the navigator was able to keep writing course notes without a hiccup. The drop-top Vette is great for cruise nights but during a rally the wind at high speeds didn't help the navigator keep the notes in the passenger compartment which may explain their overall rally score. The grandson read the rally instructions very carefully and scored 530 points. His success as a navigator can be attributed to the comfortable interior he got to work in. Grandpa was only able earn a measly 466 points, probably due to half of the route instructions being blown out of the car and lost on course from the convertible top. Final Result: Ford Fusion Hybrid victorious. However, remember this test was conducted by total buffoons in a road rally environment. 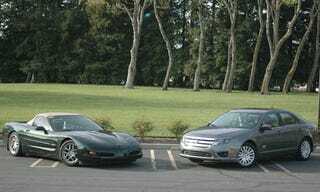 If we took these two cars to the drag strip and a local Friday night burger joint car show the sports car Corvette would probably get the nod over the hybrid. But on this day, Grandpa in his old-school Corvette was beaten by his grandson in a new-fangled hybrid. Jim doesn't mind that the Fusion whipped him on fuel mileage, "The ability to do ridiculous tire smoking burnouts outweighs the gas mileage factor in my book. Burnouts is what this country was founded on. I work hard so I can afford the extra gas money and new rear tires on the Vette. It's totally worth it!" We drove the hell out of did a full road test of the Ford Fusion Hybrid and if you want to know what kind of girl this car will help you meet (do you like chicks who recycle everything? ), or learn if you can fit a body in the trunk (plenty –this thing will be a big hit with the Mafia) check out the Racer Boy review at Speed:Sport:Life.